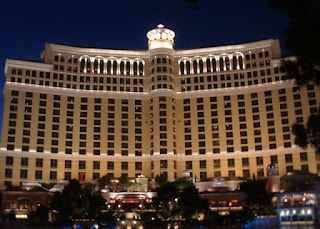 The Bellagio is one of Las Vegas premier hotel casinos and probably ranks about equal in qaulity with the Wynn even though the Wynn was designed to be fancier and tends to be more expensive. I think the new Palazzo may be even nicer but I have not been there yet or read reviews. The Bellagio is a favorite hotel for many Las Vegas regulars, combining as it does a central strip location, a glamourous and tasteful european decor, and Las Vegas' most beautiful free attraction the Bellagio Fountains, which put on a super show every half hour. Don't miss the fountains of the Bellagio regardless of where you stay - this is really a spectacular syphony of music and water. Great "seats" are always free and always good - just stand anywhere. I'd recommend being down at the fountains rather than far away, and although it's tempting to watch them from high above across the street at the Paris Las Vegas I think it's much more spectacular up close.